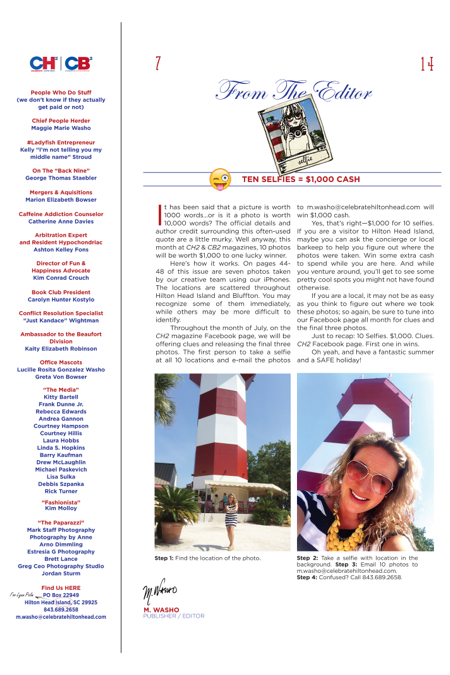 Hilton Head Magazines: CH2/CB2: Editor's Note: 10 Selfies = $1,000 CASH! It has been said that a picture is worth 1000 words…or is it a photo is worth 10,000 words? The official details and author credit surrounding this often-used quote are a little murky. Well anyway, this month at CH2 & CB2 magazines, 10 photos will be worth $1,000 to one lucky winner. Here’s how it works. On pages 44-48 of this issue are seven photos taken by our creative team using our iPhones. The locations are scattered throughout Hilton Head Island and Bluffton. You may recognize some of them immediately, while others may be more difficult to identify. Throughout the month of July, on the CH2 magazine Facebook page, we will be offering clues and releasing the final three photos. The first person to take a selfie at all 10 locations and e-mail the photos to m.washo@celebratehiltonhead.com will win $1,000 cash. Yes, that’s right—$1,000 for 10 selfies. If you are a visitor to Hilton Head Island, maybe you can ask the concierge or local barkeep to help you figure out where the photos were taken. Win some extra cash to spend while you are here. And while you venture around, you’ll get to see some pretty cool spots you might not have found otherwise. If you are a local, it may not be as easy as you think to figure out where we took these photos; so again, be sure to tune into our Facebook page all month for clues and the final three photos. Just to recap: 10 Selfies. $1,000. Clues. CH2 Facebook page. First one in wins. Oh yeah, and have a fantastic summer and a SAFE holiday!